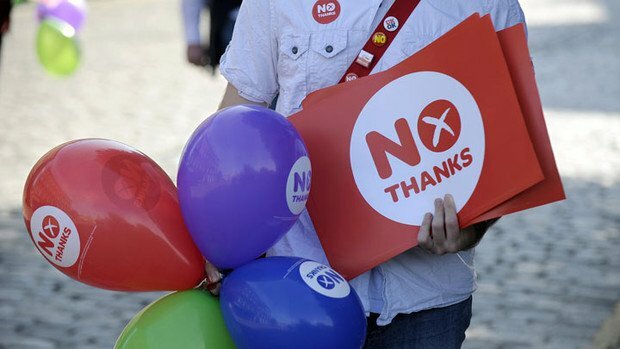 Scottish voters decisively rejected independence after voting to stay in the UK. With 31 out of the country’s 32 council areas having declared after Thursday’s vote, the “No” side has an unassailable lead of 1,914,187 votes to 1,539,920. Scotland’s First Minister Alex Salmond called for unity and the unionist parties to deliver on more powers. UK’s PM David Cameron said he was delighted the UK would remain together and called for national unity. The result became a mathematical certainty at 06:08, as the returning officer in Fife announced a comfortable “No” vote. Shortly afterwards, Alex Salmond said he accepted the defeat and called for national unity. He said the referendum and the high turnout had been a “triumph for the democratic process” and promised to keep his pledge in the Edinburgh Agreement which paved the way for the referendum to respect the result and work for the benefit of Scotland and the UK. “Scotland will expect these to be honored in rapid course – as a reminder, we have been promised a second reading of a Scotland Bill by March 27 next year. Alex Salmond said he would shortly speak to the prime minister on the results. He highlighted the “empowerment” of first-time voters, including 16 and 17-year-olds. And the First Minister said: “Whatever else we can say about this referendum campaign, we have touched sections of the community who have never before been touched by politics, these sections of the community have touched us and touched the political process. In a rallying call to his supporters, Alex Salmond urged the “Yes” voters to reflect on how far they had come. “I don’t think any of us, whenever we entered politics, would have thought such a thing to be either credible or possible,” he said. “Over the last few weeks we have seen a scare and a fear of enormous proportions – not a scaremongering directed at the Scottish people but the scare and the fear at the heart of the Westminster establishment as they realize the mass movement of people that was going forward in Scotland. This margin of victory for the Better Together campaign – 55% to 45% – was greater by about 3% than that anticipated by the final opinion polls. The winning total needed was 1,852,828. Speaking in Downing Street, David Cameron said the result was decisive. He said: “Now the debate has been settled for a generation, or as Alex Salmond has said: <<Perhaps for a lifetime>>. David Cameron said the three main unionist parties at Westminster would now follow through with their pledge to deliver more powers to the Scottish Parliament.